Daylight’s Feeling Forms. Nicola Farquhar. Nicola Farquhar’s current show at Hopkinson Mossman is titled Daylight’s Feeling Forms and features 11 paintings by the artist. As is to be expected by Farquhar, the paintings are portraits of women and each has been titled with a female name. The portraits are of a moderate scale maintaining a relationship with their source and creating an intimacy with the viewer. The artist has painted the figures in an abstracted style that results in illustration less of the physical attributes of the women she paints, but of something deeper and more insightful. The layering and varied methods of paint application by the artist concurrently conceal and reveal aspects of the figures character. This technique draws forth cellular imagery, thoughts of stratification and construction, giving the work a scientific facet that is very intriguing. This is balanced by the inclusion of vines and floral references in the work that offset the biology of the images with a decorative element. The division of the face through compartmentalisation of colour and mark is diagrammatic and references the tradition of abstraction, especially artists such as Richard Diebenkorn. There is also a fauvist quality to the artist’s new works that is interesting and contributes to the undeniable vigour of the work that is part of experiencing Farquhar’s works. There is also quite obviously the reference to traditional portraiture in terms of the compositional choices the artist has made however, these historical references do not impede the work in its ability to be read in contemporary terms but contextualise the works as explorations of paint. Repetitive mark making in the paintings creates a sense of energy giving the portraits an aura and humanistic value. This energy is carried over into the viewing experience also as the quantity of paintings at their moderate scale require the viewer to actively approach the paintings at a close proximity rather than passively view from a distance, from which the best aspects of the work, the layering and painted surfaces, would be missed. The emphasised individuality of each of the paintings is also very successful as it relates to individualised approach the artist takes towards rendering the figures she portrays, not adhering to conventional depiction of facial features but working instead far more responsively to the figures and the paint she is working with. The uncertainty of identity in the portraits is counteracted by the artist’s confidence towards how she lays the paint down on the surface of her works. The artist’s use of colour also makes the viewer conscious of the science behind vision. 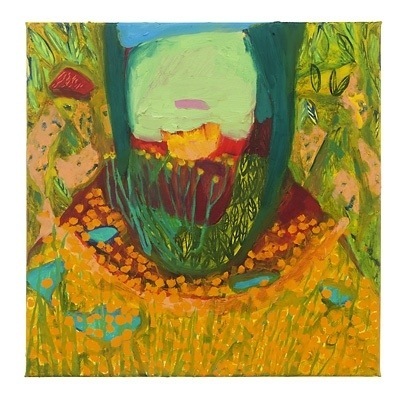 Farquhar’s utilisation of complimentary colours that pull forward and push back against each other draws our attention to perception of image in a way that really emphasises the strengths of paint as a medium, reinstating the value not only of painting but also of portraiture in contemporary art.